Jeff Bezos, the CEO of Amazon is the person standing behind the great success of this online retail giant. In the era of digital technology, Amazon is the name familiar to most people when thinking of online shopping. After just two decades of its existence, Amazon had the highest estimated capitalization value in the United States, ~$317 billion in 2015. In 2014, the company grossed more than $90 billion in revenue. In the childhood, the founder of Amazon spent a lot of his time during the summer fixing windmills and tools in his farm. Bezos shares that his grandfather was the one who taught him many lessons in life. Jeff studied mechanical engineering, electrical engineering and computer science. In 1994 he left his job on Wall Street and moved to Seattle, where he founded Cadabra.com, an online bookstore with more than 200.000 titles. 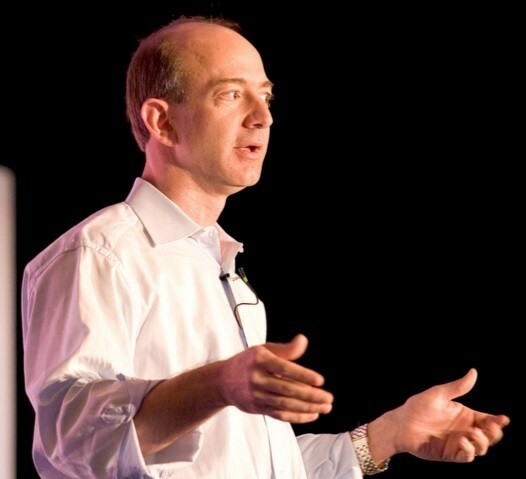 In 1995 he changed the name of the company to Amazon – alphabetically this name appeared among the first results. Good idea! In 1996 Amazon.com had 2,000 visitors a day, a year later in 1997 – 50,000 visitors a day. In May 1997 Amazon.com entered the stock exchange with the symbol AMZN. In December 1999, Time Magazine named Jeff Bezos the “person of the year“. Today, Amazon.com is diversified in different lines of products: DVD, CD, software, video games, electronics, clothes, furniture, dishes, books, etc. Bezos has overshadowed the competition by creating a quicker and more convenient online shopping process than other retailers. For example his store started giving suggestions based on buying habits, 1 clicks purchase option, and more. In the same way as Google and Microsoft, Amazon has absorbed numerous companies, such as Audible (audiobooks), BookSurge (books), Mobipocket (ebook creation) and the Fabric.com (fashion). In addition, it has launched its own products, such as the Amazon Kindle and Amazon Fire. Amazon is more than a shop, as it allows the users to express their opinions and share views. It is a technology power, manufacturing tablets and mobile phones; companies like Airbnb and Uber helped with their leased servers, their hundreds of millions of customers – to bundle the gigantic flow of goods in the world. Although the company was in the red for years, it has overcome the (planned?) losses and continues to be more prosperous and competitive than ever. Since recently Jeff’s company is testing delivery drones. They have developed drones capable of carrying packages of up to 2.3 kg at a speed of 80 km hour, which covers 85% of the products it delivers. Now Amazon’s boss also decided to launch a company in air cargo and maritime transport, to control the entire chain of distribution. The arrival of Amazon in the airfreight is part of its deployed strategy to depend less on the services of the two American logistics giants – UPS and FedEx. Amazon is now expanding their same day delivery to many major cities. The company is seeking to challenge the major French delivery service La Poste in parcel deliveries, and aims to control the end-to-end distribution chain. Jeff Bezos owns a aerospace company, Blue Origin. His intentions for this company were long shrouded in mystery. Finally there’s clarity. Blue Origin exists since 2000 and since 2005 it started developing a space rocket. At a meeting Bezos revealed his grand plans for the company. According to Bezos, if all goes according to plan, in 2018 Blue Origin will be ready for space tourism. Passengers will start to be taken to space to experience weightlessness for a few minutes, writes The Washington Post (by the way, now The Washington Post newspaper belongs to Bezos). The plan is to start test flights next year, and to start working on the questions of comfort, noise during the flight etc. If the tests are a success, six passengers at a time can go up to 100 km altitude, where they can wave at the Earth through large windows. The price of the ticket is yet not known. Recently Jeff and his company’s astronaut have successfully tested the New Shepard suborbital manned rocket with reusable launch system. The New Shepard is being developed by Blue Origin as a system for commercial suborbital space tourism. In February 2016, Virgin Galactic, a competitor of Blue Origin, has unveiled the VSS Unity, a huge suborbital spaceplane that will be tested soon. At Virgin Galactic a trip will cost $ 250,000, but it is not known yet when the first flight will be scheduled. Bezos sees space tourism as an important step in the development of new technology. The Amazon CEO compares it to the early days of airplanes or how video games have helped in the development of powerful computer chips. There are people able to take precedence over others, to act even when the risk seems reckless or stupid. People who believe in themselves and follow their instincts. Jeff Bezos had this experience in the great unknown – the Internet, and took advantage of its commercial potential. Few companies in the world had the power to change our lives. Today above all these are: Microsoft (Bill Gates), Google (Sergei Brin and Larry Page) and Amazon (Jeff Bezos). The magic seems to lie in the founder/CEO of the company. Jeff Bezos, the CEO of Amazon has developed an online store with the largest assortment in the world, changed the relationship between the customer and seller, and is an entrepreneur rarely seen. Did I mention that he has recently purchased the Washington Post? Jeff is described as having “transcendental alien intelligence“. Jeff is described as a person who “likes to control other people.” He always makes sure that he knows everything about his companies, contracts, press etc. Every aspect goes through his careful consideration. Even the packaging and delivery – he observes activities in the Amazon’s warehouses and has been known to stop selling certain products that took too much time to package. Jeff Bezos is famous for putting an empty chair at each meeting. The chair symbolizes the customer. This helps Bezos and the company to be aware of what the customer could think of their decisions. Do you know any other interesting facts about Jeff or his companies? What is your opinion of Jeff’s business practices?